I think two of the best combinations are coconut and chocolate. 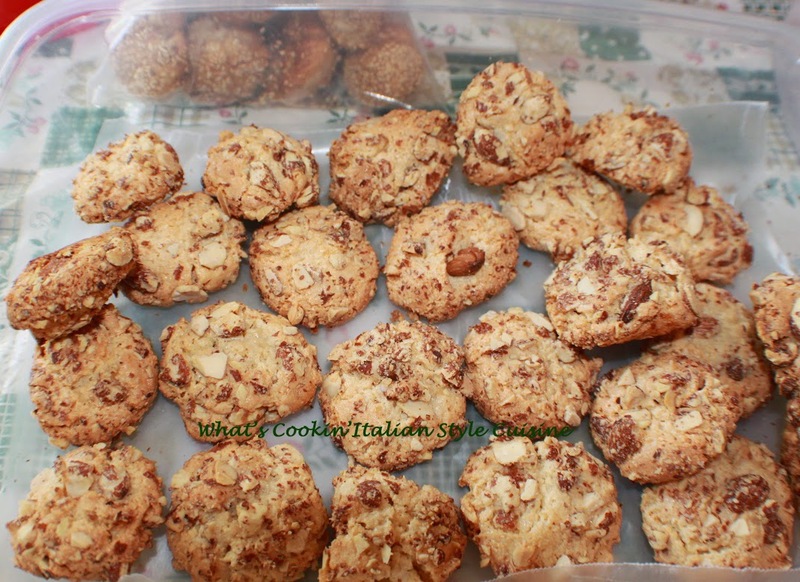 These cookies are rich with flavor of both and the bonus is they are rolled in sliced almonds before baking with that toasted coating to finish them off to be the best cookie that bursts with all the perfect flavors that I love. Hope you like this one. Perfect for a cookie tray! Come check out the recipe below. This is an easy Italian cookie. Perfect with espresso! Preheat oven to 325 degrees and line two cookie sheets with parchment paper or use a silpat mat. Beat the sugars and the butter together around 3 minutes till light. Then add the egg, extracts. Add the flour, baking soda and salt. Fold in the coconut and chocolate. Drop by tablespoonfuls and arrange the sliced almonds on the tops (I actually dunk the spoon into the almonds). Bake on lined cookie sheets until set around 15 to 18 minutes.